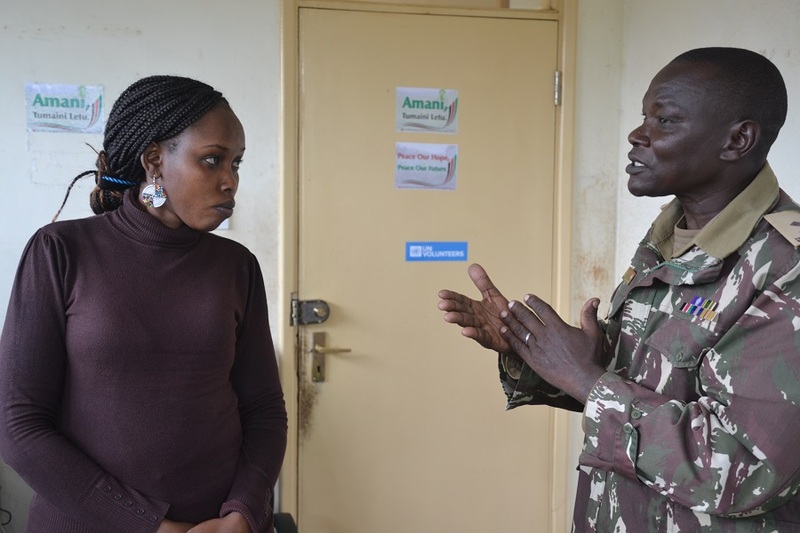 This year, 16 UN Volunteers were deployed across Kenya to prevent electoral violence and promote peace during the general elections held in August, helping strengthen national capacities for conflict prevention. UN Volunteer Castro Baraza sits in his office at the Kisumu County Headquarters finalizing reports of his pre-election peace building activities. It is three weeks since the presidential results were announced, and Kisumu remains peaceful with business fully operational and the new County administration already taking charge. Castro is however still hard at work, ensuring the peace dividends are maintained and the development agenda in the region is realized. Castro is one of the 16 UN Volunteers deployed across the country earlier in the year as part of ongoing support to a programme on Strengthening National Capacities for Conflict Prevention by the United Nations Development Programme (UNDP). “My responsibility is to support the development of a robust peace infrastructure in the Nyanza region of Kenya. Working closely with the County administration, particularly the County Commissioner for Kisumu, I am tasked with coordinating the engagement of peace actors and monitoring and ensuring effective implementation of peace building initiatives in the region,” Castro explains. The day-to-day nature of my role means that I have to deal with highly sensitive political issues with impartiality and honesty to promote cohesion and peace. The UN Volunteers were deployed to scale up the peacebuilding activities in the context of the 2017 general elections under the UWIANO platform, a national multi-stakeholder conflict prevention and response system. The platform integrates the use of SMS, Incident Reports and Media reports to help strengthen peace and conflict prevention efforts in Kenya. I am proud to have supported a peaceful electoral process. The beneficial experience is mutual, as I gained expertise in my field while building the much-needed trust between communities and local government administration. In his support to the 2017 national elections, Castro fondly remembers the peace caravan he organized as a culmination of a series of peace-building initiatives he spearheaded for several months under very limited budget and time constraints. Some key activities he successfully organized included peacebuilding forums with politicians, engaging youth motorcycle riders on violence prevention, peace campaigns in local media, and county-wide youth forums under an initiative called Sauti 47. UNDP’s “Strengthening National Capacities for Conflict Prevention” programme is supported by the European Union, the Swedish Development Agency (SIDA), the United Kingdom Department for International Development (DfID) and Kenya’s Ministry of Interior and Coordination of National Government, and implemented through the National Directorate for Peace Building and Conflict Management (NSC/PBCM), with multiple national and local partners.